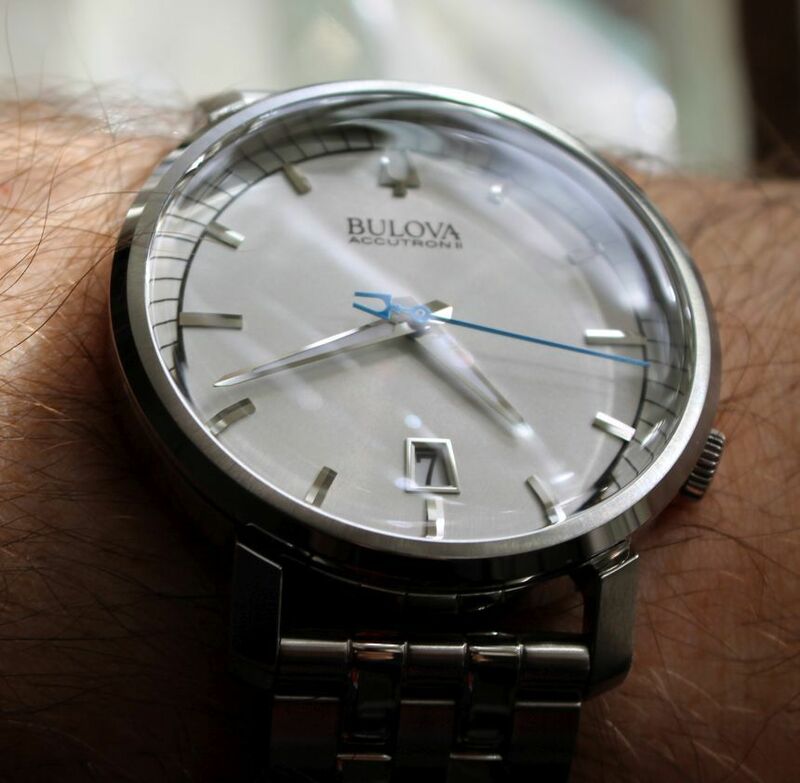 In 2010, Bulova debuted its high precision Ultra High Frequency (UHF) quartz movement in its Precisionist collection. Now, the UHF movement finds its way into the Accutron II collection, including the vintage-inspired Alpha case and Lobster case. The Alpha 96A155 is a tribute to the iconic Accutron 214 Spaceview Alpha. As the world’s first electronic watch, the Accutron used a 360 hertz tuning fork instead of a balance wheel as the timekeeping element. The tuning fork was powered by a one-transistor electronic oscillator circuit and, instead of the ticking sound made by mechanical watches, it had a faint, high pitch hum that emanated from a vibrating tuning fork located between the movement’s two electromagnetic coils. Accutron famously advertised that, “It doesn’t tick. It hums.” A forerunner of the modern quartz watch that also keeps time with a vibrating resonator, the Accutron guaranteed accuracy to a minute per month, or 2 seconds per day, which was considerably better than any mechanical watch of its time. Aimed squarely at the hearts and minds of watch collectors, the Alpha 96A155 evokes the original Accutron 214 Spaceview with an exposed movement in lieu of a dial. The curved mineral glass box crystal is printed with minimalist “Bulova Accutron II” text for an unobstructed view of the technical aesthetic of the dial. The copper electromagnetic coil is located between 10 and 12 o’clock, and the gold-plated brass movement plate is sunray finished and stamped with the caliber number, “BA101.10”. Round metal hour markers filled with luminous material are set within a green chapter ring. A metal tuning fork logo filled with luminous material is set within the green chapter ring at 12 o’clock. The chapter ring is also printed with a white minutes track. The green chapter ring frames an inner golden flange that is sunray finished. White luminous handsets are used for optimal legibility. The Lobster 96B232 dial is sunray finished with applied, luminous hour markers and luminous hands. Instead of a technical aesthetic, the dial is printed with 262 kHz at 6 o’clock. 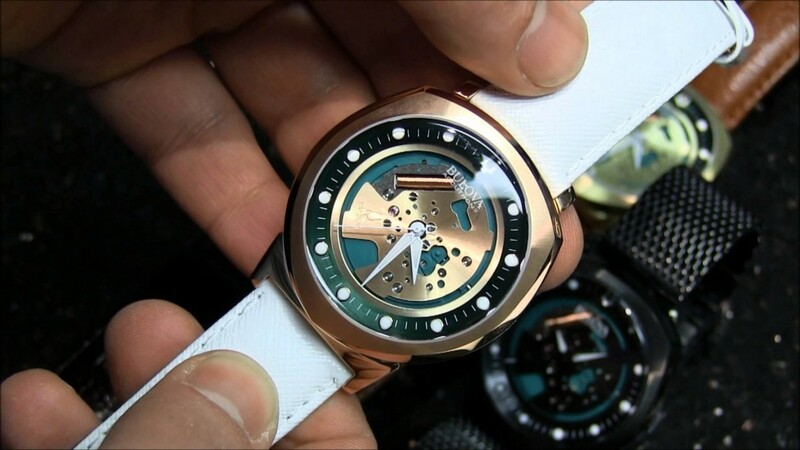 The dial features a rotating inner bezel. My minor quibble with the Lobster dial is the cheap looking date wheel with the dot-matrix printing. Despite its budget price, if a common household laser printer can print without pixelation, then certainly Bulova can afford to do a better job in mass producing its date wheels. With the level of detail that went into the rest of the watch, including the case, the bracelet and the movement, the date wheel is an unfortunate oversight since the Lobster would otherwise have a perfectly stylish and handsome dial. The Alpha 96A155 case is inspired by the 1960s Accutron 214 Spaceview Alpha with a similar alpha case and scalloped lugs. Rather than a backset system, the Alpha 96A155 has a pullout crown integrated into the case at 3 o’clock. 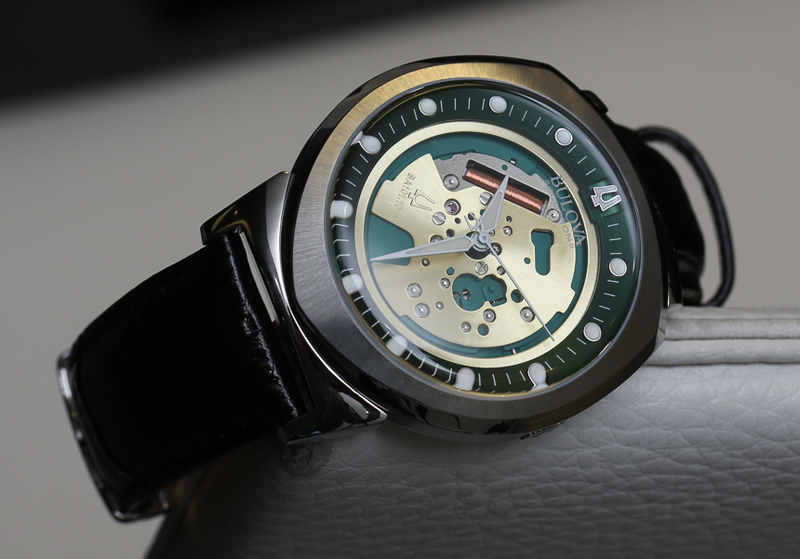 Similar to other Accutron II models, the solid caseback is attached by four screws. The 42mm stainless steel case is nicely finished with both brushed and polished surfaces. However, after just a couple months of wear, it’s evident that despite its brushed finish, the case sides will show dings and scratches. 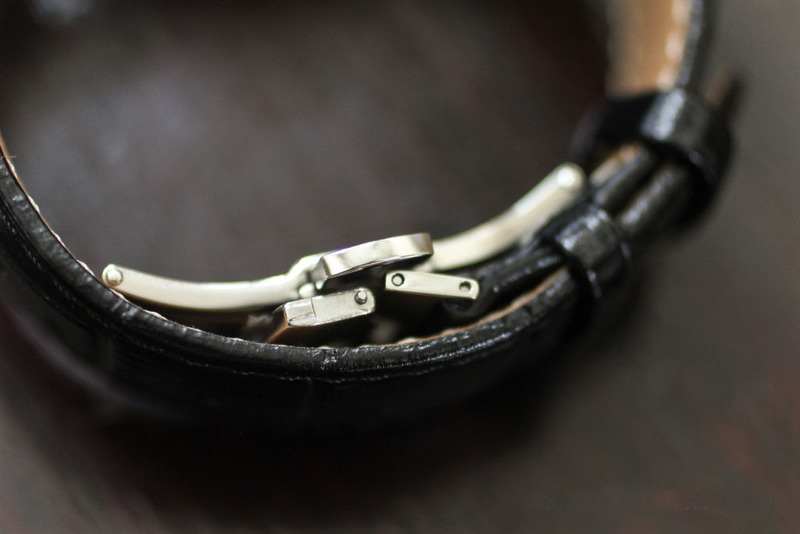 The Alpha 96A155 is fitted with a leather strap and a folding deployant clasp. I found the original clasp uncomfortable since it digs into the wrist and, more importantly, I found the design inadequate and flawed. Although the clasp attaches to one end of the strap, on the other end, a simple pin through a strap hole is the only thing securing the clasp closed. In other words, nothing is holding the deployant clasp closed other than the uncomfortable pressure inside the wrist. It’s an unusual set-up and one that (thankfully) I’ve never seen before; however, a reliable, double-fold deployant clasp is relatively inexpensive and I’d highly recommend purchasing one and discarding this original one. Meanwhile, the Lobster 96B232 is fitted with a mesh bracelet that is thin, light and comfortable to wear. Many watch collectors become more than a little sniffy when the subject turns to digital watches. For some they have all the wrong ingredients; cheap quartz movements, low rent finishing, not a blued hand or a guilloche dial in sight, and therefore generally not worthy of serious consideration. While many watch connoisseurs regard them as the poor relation of horology, there was a time in the early to mid-70s when digital LED watches were out of reach to the average man in the street, and they were a much coveted plaything for the rich and famous. The caliber BA101.10 is a high-grade, 8-jewel, 10 ligne 262.144 kHz UHF quartz movement with a remarkable accuracy of ±10 seconds per year (or ±0.027 second per day), which is eight times greater than a standard quartz movement. Since a UHF movement is silent, I could not independently measure its accuracy on a timing machine. However, at the heart of Bulova’s UHF movement is sound research invented by Dr. Hirofumi Kawashima, who’s been engaged in the research and development of quartz crystal resonators for watches, coupled quartz crystal resonators, peripheral flexural resonators, extensional resonators, various piezoelectric sensors (temperature, vacuum, weight, and acceleration), high precision quartz crystal oscillators (S-TCXO) and piezoelectric actuators since the 1970s. In 1994, Dr. Kawashima invented the torsional quartz crystal resonator and assigned his patented invention to Seiko Electronic Components Ltd. 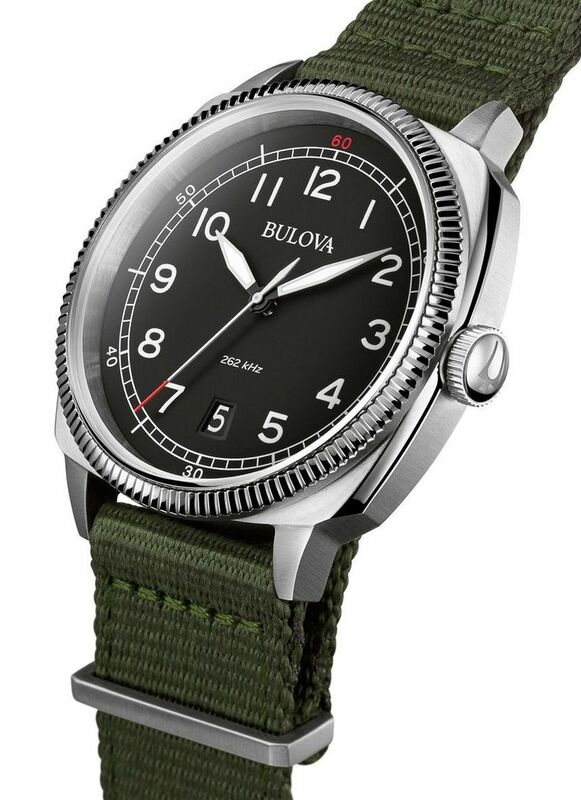 Similarly, Bulova’s UHF technology is based on a three-prong torsional quartz crystal resonator that twists instead of oscillates back-and-forth. The torsional quartz crystal resonator’s innovative construction reduces the effects of temperature variation without a thermo-regulating integrated circuit. Specifically, frequency temperature behavior is improved by its unique cut angle, an optimal thickness-to-width ratio, unique shape and excitation electrode structure. In laboratory testing, the torsional quartz crystal resonator exhibited good frequency temperature behavior under a range of temperatures. How does the UHF movement stack up against other watch movements? Well, compared with Seiko mechanical and Spring Drive movements, Bulova’s UHF technology stacks up remarkably well in terms of state-of-the-art engineering. With its 262.144 kHz ultra high frequency, Bulova’s UHF technology is essentially immune from mechanical disturbances caused by gravity. In addition, the movement’s innovative design reduces the effects of temperature variation without the high maintenance of a thermo-compensated IC. Finally, the movement is efficient since the standard lithium watch battery doesn’t need to be changed for two years. By way of comparison, the Seiko caliber 6R21 is a 29-jewel automatic movement that beats at 28,800 bph, or 8 beats per seconds. Its accuracy is +25/-15 seconds per day; and it has a 45-hour power reserve. The Seiko Spring Drive caliber 9R65 manual-winding quartz movement vibrates at a frequency of 32.768 kHz, or about 1 to 2 beats per second. Its accuracy is ±15 seconds per month, or ±1 second per day. The Spring Drive has a 72-hour power reserve. Despite the minor flaws and shortcomings, notably the cheap deployant clasp (Alpha), shoddy date wheel (Lobster) and the inevitable scuff marks on the case surfaces of both, the Accutron II remains a compelling watch collection due to its stylish retro designs, its innovative torsional quartz resonator technology and its 262.144 kHz UHF movement that results in a continuously smooth seconds hand. When it debuted in October 1960, the Accutron tuning fork retailed for $125, or today’s equivalent of $1,000. Today, an Accutron II is affordable fun at $450 (Alpha) or $550 (Lobster), and its budget price should yield an abundance of satisfaction for all levels of watch enthusiasts.